This extension was to help relieve Routes 154 and 157 and was part of the trolleybus conversion program. This superb shot of RT488 was taken in the brief period that the route was extended to Elmers End Garage and shows the offside route stencil - upper case blind - and the driver wearing if I remember correctly a " dust coat " . Extension to Elmers End / Eden Park withdrawn - 194 increased to compensate. 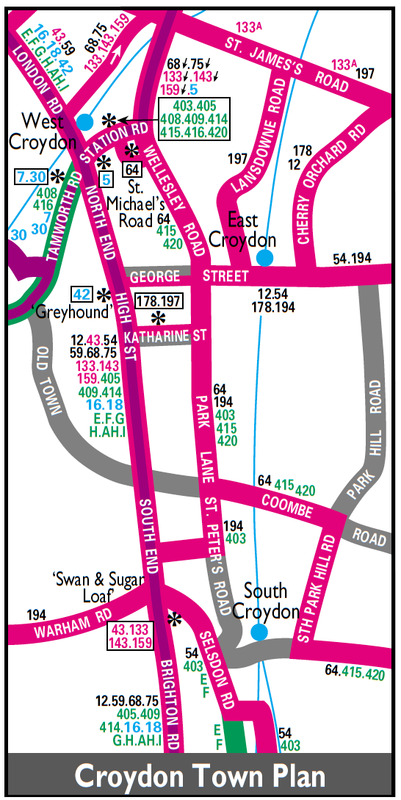 Extended from West Croydon to Wimbledon Stadium as part replacement for withdrawn trolleybus route 630. Elmes End (ED) allocation introduced. Withdrawn between Tooting Broadway and Wimbledon Stadium. Sat and Sun Routemaster operation introduced at Croydon (TC) and Sunday allocation withdrawn at Thornton Heath (TH). Mon-Sat RM operation introduced at Croydon (TC). Sun withdrawn between Croydon and Tooting. Sun Route re-introduced between Croydon and Tooting. Croydon (TC) allocation withdrawn in favour of increase at Thornton Heath (TH). Extended from Addington to New Addington partly replacing withdrawn Route 130B. Withdrawn between West Croydon and Tooting - replaced by new 264 and diverted instead via London Road to TH Garage. Sun Route re-introduced replacing withdrawn section of Route 264 on that day. Night Route introduced but because there was a different routeing in New Addington Route numbered N64. It will also operate 24 hours a day.